Kenner did it, McFarlane did it, and now NECA is doing it: combining their separate Aliens and Predators licenses into one nifty two-pack! When the crew of the Nostromo answers a distress signal from a desolate planet, they discover a deadly life form that breeds within a human host. And so the horror begins - a horror that will end the lives of six crewmembers and alter the life of the seventh forever. You know what reading that bio makes us think? 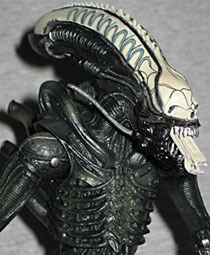 We really need a NECA Ripley. Preferably with a Power Loader. But Sigourney Weaver's likeness rights are probably way too expensive. Not even Hot Toys - the company known for sculpting toys that pass all the way through the uncanny valley and come back out again on the human side - had a real Sigourney Weaver likeness on their Ripley figure. But still, it doesn't cost anything to ask her, right? 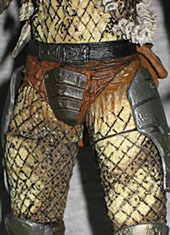 Come on, NECA: you're the folks who showed the world that Pinhead could be done; we believe in you! The Alien in this set appears to be the same mold as NECA's existing Alien Alien - ie, the one from the first, super rapey film. I say it "appears" to be, because I don't have the original to compare. Despite the "much fanfare" and "lots and lots of promotion" Monkey Boy mentioned, I'd never even heard of the thing until he reviewed it. Presuming this is the same thing, it was sculpted by Kyle "Tankman" Windrix. It really is an impressive sculpt, too: sure, all the tubes and ridges that you'd expect to see on the costume are here on the figure as well, but even the "bare" patches of (whatever xenomorphs have instead of) skin aren't actually blank. He's chitinous, not rubbery. Articulation is good, and all the joints are tight. 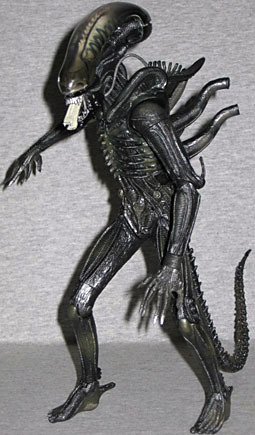 The Alien has hinged ankles, hinged knees, swivels on the lower thigh, a V-crotch, swivel wrists, hinged elbows, swivel biceps, swivel/hinge shoulders, a balljointed torso and balljointed head. The jaw is hinged, and the inner mouth extends manually. The tail is bendy, if you want to count that. The swivels are rather blatant, but it's not like Giger's designs really lend themselves to easily hidden balljoints or anything, you know? Just as on McFarlane's Alien, the smoky dome on the thing's head is a separate piece, and you can remove it if you're very, very careful. Most of the details beneath that dome are simply painted on, rather than sculpted, but it's not like that makes a huge difference when you're looking at it. The creature's teeth and nails are silver, and the rest of him is dark grey. The previous release that Monkey Boy reviewed had a distinct brownish tint, which is true to the film (depending on how the scene was lit), but this more neutral tone suits the monster. It would have been neat if they'd made the inner mouth closed, rather than open, to set it apart from the previous release. The first set I got, the Alien had two left thighs - not a tremendous flaw, since it's so inhuman, but it was impossible to get the sculpted details to line up in that case. No question the mistake happened because the limbs look so similar, but something similar happened two years ago with Monkey Boy's figure, so really take a look in the packaging before you buy. Deep in the jungle, several bodies have been discovered skinner and hanging from the trees - who or what could have done this is a mystery. An elite special forces team is called in to investigate and the discover something far worse than they could have ever imagined - the Predator - an alien which has come to Earth with the desire to hunt humans for sport. Hey, it's nice to see this bio doesn't use the goofy expanded universe term "yautja" for the Predator, like the recent Berserker and Falconer Predators. 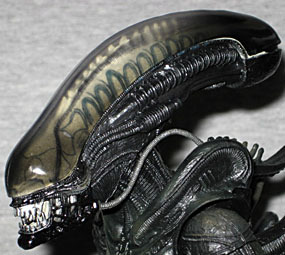 The fact is that there is no "real" name for the Predator species, not the way "xenomorphs" is for the Aliens. So basically, any time someone uses that name, they just look like fanboys trying to canonize their own fanfic. 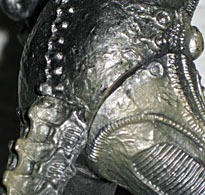 Like the Alien, the Predator is also a reused sculpt - but this one is of a more recent vintage. 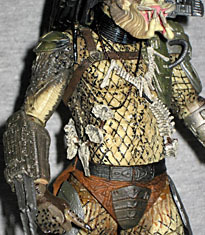 Below the neck, this is the same mold used for the Classic Predator in the Predators line. He's appropriately muscular, and everything but his right arm is molded with his netted outfit. His left hand is open and his right hand is closed, and he's wearing all the correct armor. It really would be better if the control panel on his left arm could open to show his self-destruct device, but that's our only complaint. 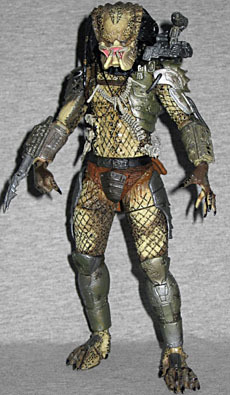 The only substantial difference between this figure and the one in Predators Series 1 is the head - while that one had the mouth open wide in a yell, this one has his mouth closed. It's a minor difference, but a difference nonetheless. The Pred looks damn scary even with all his little mandibles tucked together like this, though it always does make the "chin" look oddly long. The twin blades in his right gauntlet extend, but those don't really count as an accessory since they can't be removed. His backpack can, however, taking the blaster on his shoulder with it. 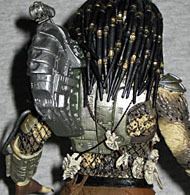 Additionally, this Pred actually has the necklace and two strings of bones around his torso - the solo-carded versions lack those, for whatever reason, so consider that a good reason to buy this set. Do be sure to check, however: I passed on one at the store that had better paint, but was missing the necklace. Speaking of the paint, one major thing to keep an eye on is the netting: since it's sculpted, that means it also has to be painted, and there isn't a factory in the world that can consistently put perfect apps on sculpted fishnets. So check those first, to find the ones that you think look best. The colors on his skin do seem to blend better on this version than on the Series 1 release, and the armor doesn't have a greenish tint. For other problems you might need to worry about, read Monkey Boy's addendum. He's highly articulated, but thankfully, he's not sculpted in that weird squat the AvP:R Predators shared. He's got balljointed ankles, swivel/hinge knees, swivel thighs, V-crotch, swivel waist, balljointed wrists, swivel/hinge elbows, swivel/hinge shoulders, and a balljointed neck. Some of the leg joints were stuck when I opened the package, but none of them required even freezer time to get moving. 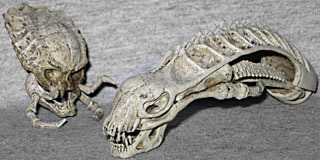 The set includes two very cool movie-based accessories: a Predator skull, and an Alien skull. Awesome! 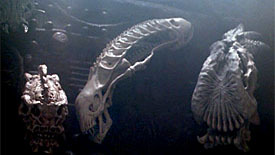 The Alien skull famously appeared in Predator 2, just one more thing that contributed to that being the more enjoyable Predator film. It was in a trophy display on the Preds' ship, and although the idea of an Aliens vs. Predator fight first happened in the comics a full year before that film was released, let's not kid ourselves: a lot more people saw Predator 2 than read the comics, so that one prop cameo gave rise to an entire franchise. The Predator skull was apparently seen in last year's Predators, and it really matches up anatomically with the Pred head. Be sure to check how the mandibles are glued on - one of mine was crooked. The back of the skull has clear divots where the dreadlocks would grow; guess those aren't hair after all! Both skulls have movable jaws, which is beyond expectations. Judging by the skull in the actual Alien's head, there should be humanoid eye sockets, but the P2 movie prop didn't have them, either. 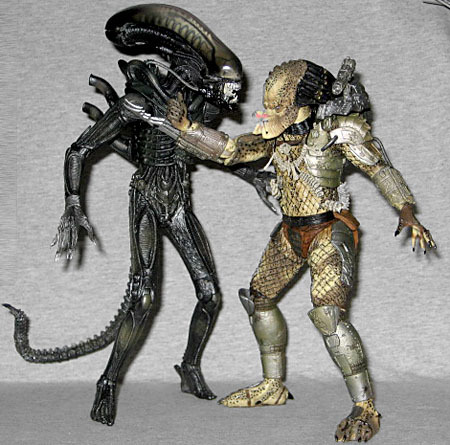 NECA's Classic Alien & Predator 2 Pack is a really cool exclusive. Both figures have been available before, but never together. Plus, a few small changes to the paint and sculpt help set these apart. The packaging is swanky, blending the poster designs of the two original films very well - for some reason, no previous two-pack has ever had the sense to do that, so kudos to Nicole Falk. Still, the biggest factor in favor of buying this set are the new accessories: while it would have been killer to get a facehugger and egg, the fact that we get two never-before-available skulls (at least not outside the 12" scale) and the Pred has all three of his bone decorations? This set is completely worth tracking down.